Young children learn best through play. Especially when pretend playing. Almost all objects can be best pretend toys for them, from blankets, chairs, TV remote control, etc. because kids use these objects to represent something else through motion and action. Even though market is loaded with high-tech toys with innovative design, pretend play is not replaceable. Role playing will always be one of the preferred play not only by kids but parents as well. And toy manufacturers are very well aware of this, which is why they design and produce pretend toys for girls or pretend toys for boys. For example, boys love to play trucks, cars, soldiers, pirates, firefighters, mechanics, etc., while girls love to pretend being moms to their dolls, master chefs in kitchens, prominent doctors or nurses, and of course, princesses. Kids love to imagine things and present in their way how they understand the world around them. They usually start pretend play at the age of three and entertain their parents with their imagination and innocence. But pretend play is more than fun. It is perfect way for kids to develop better as it helps build various physical and mental skills. Language Skills – Pretend play in some sense ‘forces’ kids to tell a story or come up with a scenario. This way they have to put their ideas into words. Kids often use words they hear without knowing the meaning. It is recommended to give a kid explanation of the word and repeat until he/she understands it completely. Pretend play helps them build their vocabulary. 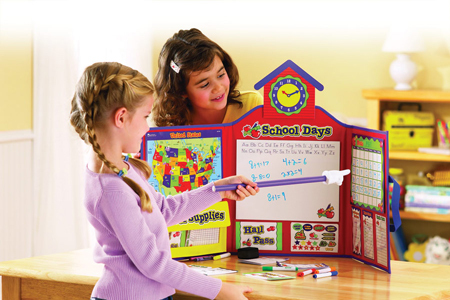 Social Skills – Best pretend toys help kids develop social skills. Kids learn to share with their peers, empathy, compassion and understanding. Problem Solving Skills – Role playing encourages kids to find solutions to dilemmas they create throughout the play. By solving imaginary problems kids are better prepared to react correctly to their real life problems. Better Understanding And Learning – Many studies showed that kids learn better when teachers and parents transform lessons into games. For example, kids can easily learn to sum and subtract by using vegetables or fruits. With four apples and a bowl, a child will better understand why two plus two equals four. It is important to visually present everything you want to explain. This way a child will better understand and learn faster.